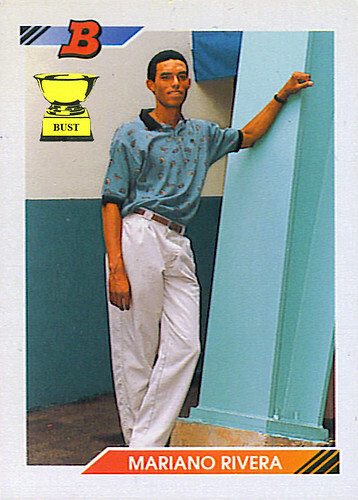 Today's fashion model: Here we see 14-year-old Mariano Rivera modeling the latest trends for junior boys. His cuffed and collared polo shirt featuring the logo of every NFL team can be found at finer Sears outlets near you, and it comes with a matching pajama set. His white Dockers are grass-stain resistant, making them fun and fashionable for him and easy to clean for his mom. Another point in these pants' favor: extra room in the crotch to help avoid any schooltime embarrassment hold that Trapper Keeper up high, Mariano, no one's going to be able to tell what you've been thinking about!